India have taken an unassailable lead at the Melbourne Cricket Ground. By winning their first Test at the ground since 1981, India have retained the Border-Gavaskar Trophy. 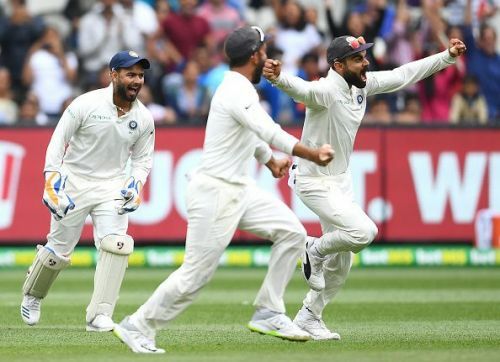 India will go into the final Test at Sydney with a massive confidence boost and will look to win their first Test series on Australian soil. In the first two Test, Indian openers, Murali Vijay and KL Rahul, failed miserably so India chose to go into the boxing day with two new openers, Mayank Agarwal and Hanuma Vihari. This decision by the management paid immediate rewards as the debutant ended the match with 118 runs and three catches. While Agarwal laid the foundation, it was Cheteswara Pujara who was the architect of the Indian innings. Pujara's 170-run partnership with the Indian skipper Virat Kohli spanned over two sessions and put India in a comfortable position. After Pujara and Kohli got out for 106 and 82 respectively, Rohit Sharma's unbeaten half-century took India to 443. Australia's pursuit to come close to India's total was derailed by the brilliance of Jasprit Bumrah. With his career-best figures of 6-33, the fast bowler from Gujarat helped India bowl Australia out for just 151 runs. In spite of a first innings lead of 292 runs, India did not enforce a follow-on on Australia. India in their second innings, India struggled against Pat Cummins, who managed to take six wickets for just 27 runs. By posting a total of 106-8, India went onto set a target of 399 for Australia. The Australian team never looked like they were going to chase down the target as they kept on losing wickets at regular intervals. Pat Cummins, the only Australian to put on a fight, scored his maiden Test half-century and took the game to the final day. On the final day, rain delayed the start but once the play resumed Bumrah dismissed Cummins to take India one step closer to a memorable victory. With just one wicket to win, India's most experienced bowler Ishant Sharma rose up to the occasion and got the wicket of Nathan Lyon.